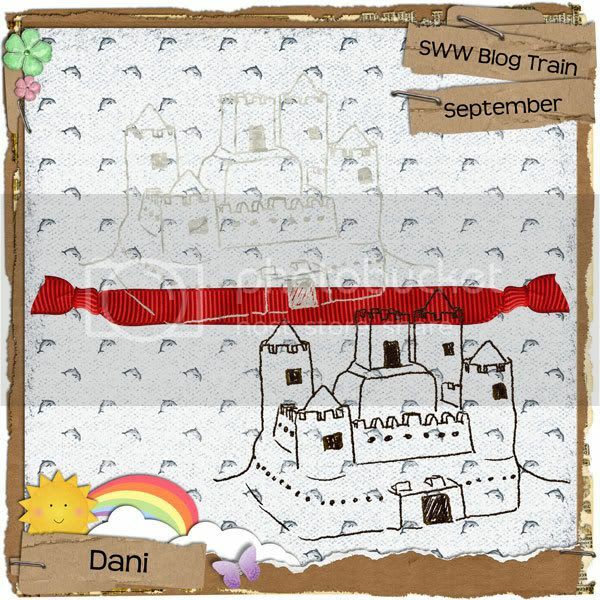 A new look and some SWW fun! 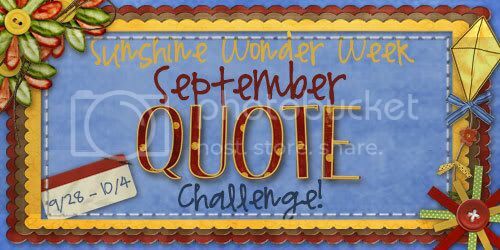 And I am personally hosting the Quote Challenge so I hope to see some great layouts again this month! Sunshine Wonder Week Blog Train Kickoff! It's that time again!!! 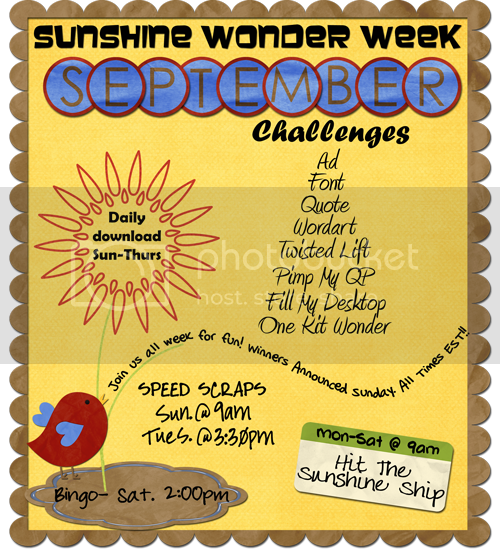 Sunshine Wonder Week is here and as always there are tons of challenges and prizes! But first, we are doing a special Wonder Girl Blog Train to make up for not having Sunshine Wonder Week in August. A few pieces that we all made that will stand well on their own but compliment the Anchors Away kit perfectly! So click the preview image to find your download! And then visit the other Wonder Girls Blogs for the rest! Happy Scrapping and don't forget to come back and join us for all the fun that starts on Sunday! OK..so I have so many more important things that I should blog about but I am going to pop in and plug the awesome book series I am in the middle of reading. Many of you have probably already at least heard about it. 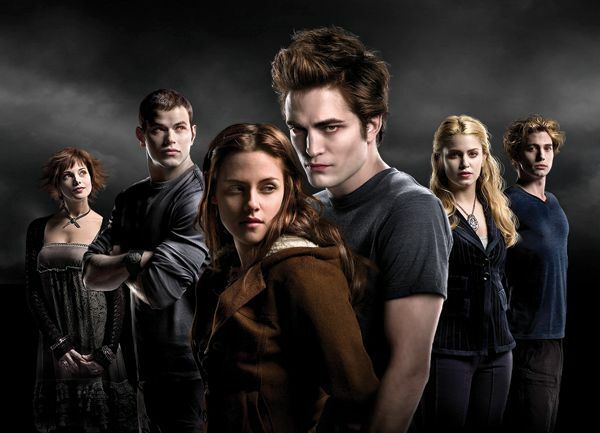 I am on book 3 of the Twilight series and I am just as hooked as everyone else! If you haven't read it yet then you should! And do it before November, because the series is so good they made a movie and it comes out November 12th! The trailer looks fantastic! It looks like they stayed so true to the book. And I took one of those silly but fun quizes this morning too. 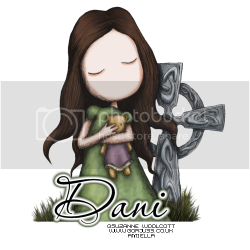 And guess which twilight character I am? Alice Cullen You are Alice Cullen. Your ability to foresee danger and misfortune doesn't diminish your bubbly optimism. You are a force to be reckoned with -- anybody with enough sense knows, you never bet against Alice. Twilight Quiz by QuizRocket.com fun tests! A sneak peek at something special. Did you think I disappeared? Sorry ::insert bashful face here:: August became one of the craziest months I think I've ever had. But almost all of it was great stuff that happened (I'm trying not to think about that ugly speeding ticket I'll be fighting in court)! I got a great new job and some of my work can be done right from home. You probably already know that I got a new puppy and that has taken some adjusting. My husband threw me a big surprise party for my 30th birthday and took the whole weekend off to spend some much needed time with the family. And all that is just the tip of the iceberg...it was a crazy and great month. But now I'm back and ready to roll.....and in a big way too! I have just finished my first ever store-worthy kit!! YAY ME! So on Sunday you should find my collab with Boyerville Scraps in the Sunshine Studio Scraps shop!! I am SO excited! And I just have to show you what my awesome fellow Wonder Girls just added to the shop. That's right...I said the Wonder Girls have added stuff to the shop!! Both items were created using the Jigsaw Peices SUN Collab. As well as a quickpage album from Wonder Girl Janel.